After several years of swift uptake by users, collaboration software has become an increasingly integral part of how work is both organized and carried out. 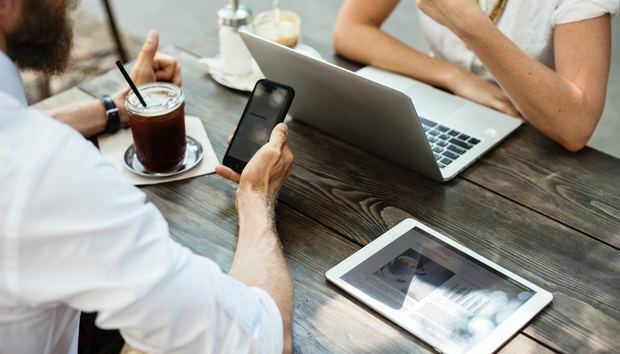 As more businesses lean on tools like Slack, Microsoft Teams and others, IT leaders are looking to deploy a new breed of collaboration tools company-wide to boost productivity and connect disparate teams. During 2017, team collaboration software matured as an enterprise option with the launch of Slack’s enterprise edition for large-scale deployments and Microsoft launched Teams to put group chat in the hands of many Office 365 subscribers. Numerous other vendors moved to capitalize on the opportunity carved out by Slack with their own group chat offerings – such as Atlassian’s Stride – even as Cisco and Facebook continued to build out their existing platforms. The stage is now set for a competitive market as more companies invest in software to connect their employees. “We are still early in terms of companies having enterprise-wide deployments, but you will see in 2018 that there will be a fair amount of momentum behind large-scale deployments,” said Irwin Lazar, vice president and service director at Nemertes Research. One of the major trends to emerge in the last year or so is that group chat is fast becoming the central hub of productivity. That’s reflected in the strategy of various unified communications vendors, said Lazar. For example, Microsoft plans to phase out Skype for Business, with Teams gradually becoming its core communications tool. And RingCentral acquired Glip to make it its main client for communications. Video conferencing is another aspect of communication that’s being rolled into team collaboration platforms, with screen sharing becoming more advanced, too, said Richard Edwards, service director and distinguished analyst at Freeform Dynamics. “The most significant [change] looking into 2018 is the ability to switch between exchanging short messages and maybe a few file attachments to being able to go into a group conference call and maybe even escalate that and do a bit of screen sharing and bring in third parties much more easily than would be the case today,” said Edwards. Despite an ever more competitive market, large-scale, integrated adoption of collaboration tools at the enterprise level remains to be done. Most companies are using these tools in silos across teams, with little strategic planning around who uses what. A group of developers might be using one tool, for instance, while the marketing department is using another. That will likely change as team collaboration becomes more popular; IT admins will have to take a more thought-out approach to deployments. Helping to drive these kinds of investment decisions: the realization by businesses that they are starting to reap the benefits of connecting teams and making it easier to share information and ideas. In many ways, Slack is responsible for the growing interest in group chat, which is reflected in the company’s impressive growth. In September, the company announced that it has 6 million daily active users, up from 5 million in January, and $200 million in annual revenues. It has increased the number of people paying for its services, too. This summer, the company reached 50,000 paid team users, up from 38,000 in January, and 2 million paid individual users, up from 1.5 million at the start of the year. Earlier this year, Slack began to actively target deployments at large business with the launch of its Enterprise Grid product. The enterprise edition includes advanced security controls and user and administrative functions for an unlimited number of workspaces. It is designed to support deployments at companies with tens of thousands of employees with separate but connected workspaces. Convincing more users to adopt the service is the next major challenge. 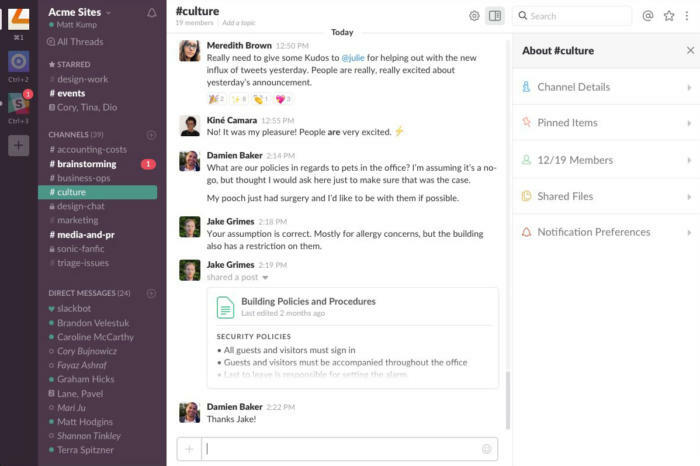 Slack has other concerns, too, including a host of rivals playing catch up and launching their own team tools that in many ways mimic Slack’s interface. This includes Atlassian Stride, Zoho Cliq and, of course, Microsoft Teams. Teams hit general availability in March this year and has the strongest credentials for becoming a “Slack-killer.” Though there are weaknesses in the platform in comparison with Slack, such as an arguably more complex interface, Microsoft holds a distinct advantage with its Office 365 integration. “The market dynamic that we have seen in the last year is that Microsoft has the momentum, for the simple reason that you look at the percentage of companies that are using Office 365 and it is very high,” said Lazar. Start typing the name of a colleague to see a list of possible matches you can choose from. It is also possible to co-edit documents. “So you could be editing a document together while we are chatting, or if we need to speak live we click a link and now we have a voice channel open between us,” he said. Even so, Slack is likely to continue to be the team collaboration tool of choice for many, especially in companies that aren't tied tightly to Microsoft, or are looking at Slack's ability to integrate with Oracle, SAP, Salesforce and other CRM applications to provide a core workspace, said Lazar. Google announced its own Slack competitor this year, as it split its Hangouts platform into two products: Meet, a dedicated video conferencing tool, and Chat, which supports group conversations and links into G Suite files. While Google has a strong productivity and file-sharing portfolio as part of G Suite, a tool like Google Docs is currently more focused on making personal documents available to colleagues, rather than supporting more advanced collaboration. 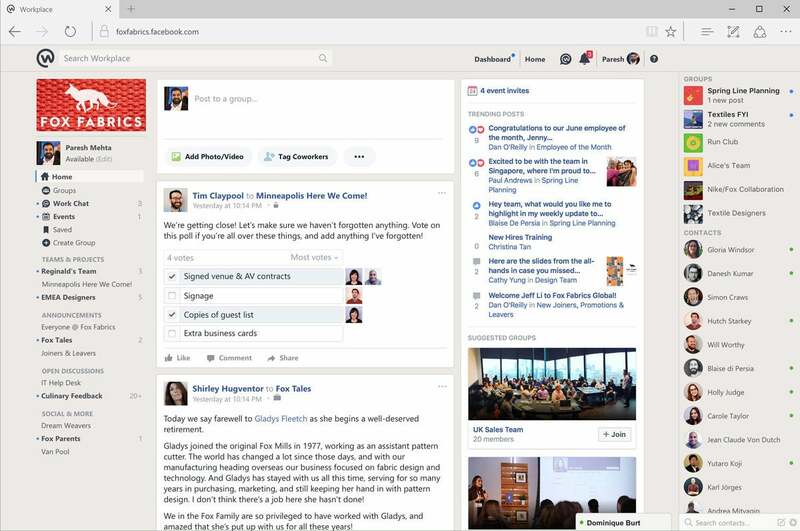 Facebook, which takes a slightly different approach to collaboration with its Workplace enterprise social network, also continues to evolve. A year after its official launch, Workplace is now used by 30,000 companies. That list includes retail giant Walmart, a major customer win announced in September, and Virgin Atlantic. The airline rolled out Workplace at about the same time in a bid to improve information-sharing between front-line staff and senior execs. It currently serves mainly as an intranet for internal communications, though the company plans to integrate other apps and processes eventually. Since the launch, Workplace has seen better-than-expected adoption, according to Virgin Atlantic CIO and senior vice president for technology Don Langford. Virgin Atlantic now has 7,000 people on Workplace, an adoption rate of about 70%. With so many choices and features rolling out or evolving, companies looking for a single collaboration platform may have to make some tough decisions.